This book is the second half of the tale begun in Dragon Keeper (Canada, USA, Europe). Sadly, the original manuscript grew in proportions that were not envisioned, forcing the publishers to split the story into two installments which now comprise The Rain Wild Chronicles. As was the case with its predecessor, the problem with this novel is that it is essentially the second part of a work that was never meant to be split into two halves. The build-up from Dragon Keeper doesn't necessarily carry over into Dragon Haven, which means that this second volume doesn't have much in the way of momentum for the last two hundred pages or so. It's not due to flat execution or uninteresting plotlines. It's more a question of that chunk of narrative was meant to be the middle part of a single book, not the opening chapters of a new novel. Hence, splitting that work into two separate installments did not work wonders where the rhythm of the book is concerned. The worldbuilding was likely the most fascinating aspect of Dragon Haven. Once again, we get more insight into the lives of dragons and their past, Elderlings and their secrets, and the Rain Wilds in general. Trouble is, Hobb offers us quite a few glimpses, but seldom follows through with more secrets. I for one would love more Rain Wilds adventures in the near future, if only to shine some light on all those tantalizing secrets. 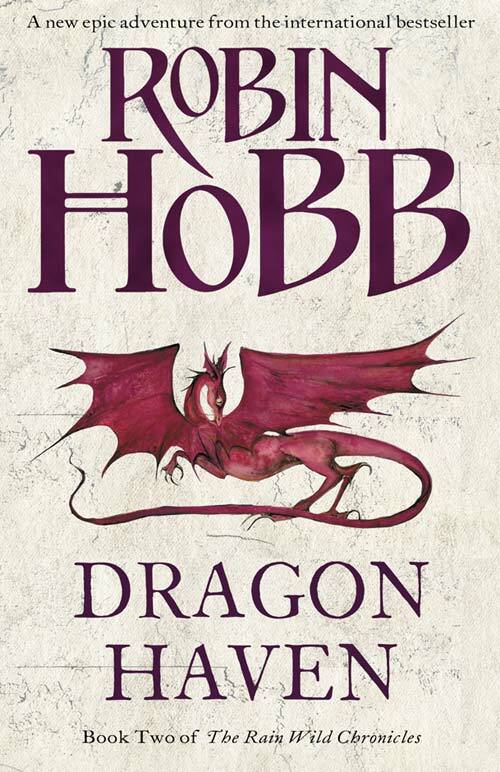 Of course, characterization remains Robin Hobb's strong suit. Yet I felt that she failed to touch me the way she usually does in this book. Once again, the emancipation of women and society's acceptance of gay people and gay couples are themes that lie at the heart of the story, as was the theme explored by the dragon keepers' plotline which focused on how individuals shunned by society strive to find their own place in the world. 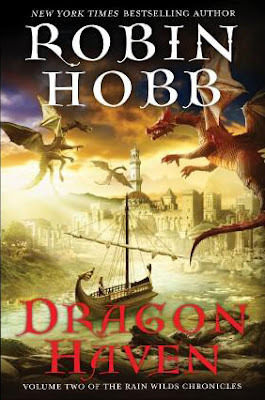 Hobb laid the groundwork for Thymara, Alise, and Sedric's storylines in Dragon Keeper, but she didn't managed to bring them to as satisfying a close as she habitually does. Which, overall, is mostly due to the fact that The Rain Wilds Chronicles are the opening chapter of a tale much vaster in scope and details. Dragon Haven offers resolution of a sort, true, but it leaves readers with a panoply of unanswered questions. To be honest, it feels as though you have finished reading the second volume of a trilogy and must now wait for the conclusion. Hobb's next project is a collection of short fiction titled The Inheritance and Other Stories(Canada, USA, Europe). It will be interesting if she'll revisit the Rain Wilds to complete this new tale afterward. . .
As I mentioned, the pace is at times an issue, especially early on. 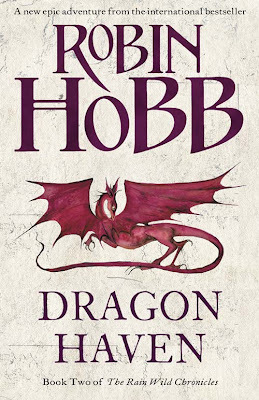 Still, Hobb has a number of tricks up her sleeve that will keep readers interested throughout. Some might find the ending a bit off-putting, but there is no helping that. Dragon Haven was meant to be the final volume of a duology that was supposed to be a single novel, but it feels like a single piece in a multilayered whole. Until we read the entire story, it's hard to judge the inherent quality of this work on its own. Too much remains missing. . .